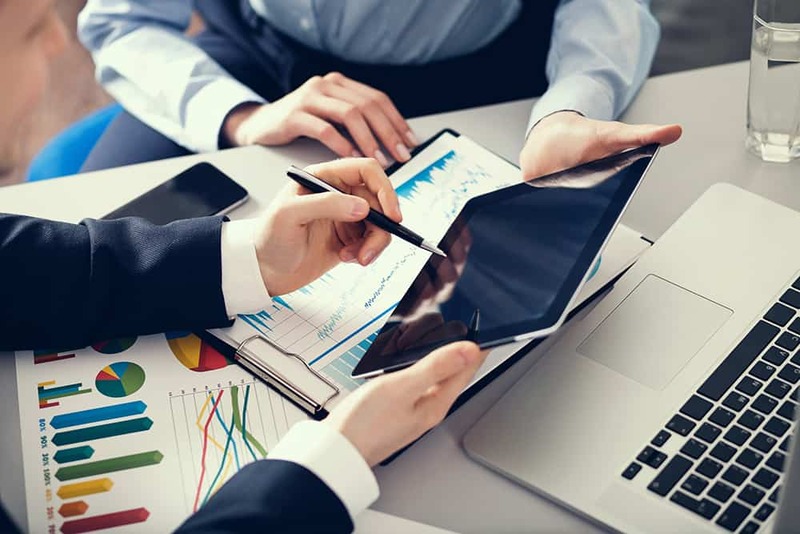 Our software program allows you to consistently choose the most lucrative investment opportunities and – more importantly – avoid bad investments. 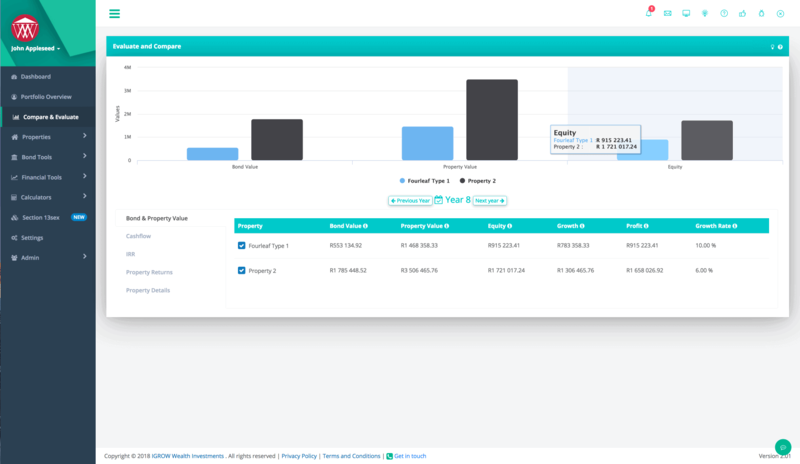 With its easy-to-learn, user-friendly (Apple-like) interface, the IGrow software gives you detailed financial reports, comparisons and strategic, world-class, colourful graphs to show the true investment potential of any residential buy-to-let properties. You will be able to focus on only the best investment opportunities – the ones that will make you the most money, with the best short-, medium- and long-term investment returns. Our software system scientifically guides you through the purchase process and allows you to make accurate financial decisions on when and how to refinance, unlocking equity and following our unique 50/50™ tax-free refinancing strategy. That’s as little as R1,20/day for 20 years to secure your financial freedom and leave a legacy for your loved ones. This is the world’s most powerful property analysis tool. It was developed to enable users to analyse the investment value of real estate. Our mission at IGrow is to educate and empower you with the world’s best products and programs to help you achieve financial freedom. One of the core components of this is the need to understand the financial analysis and evaluation of different properties, to be able to distinguish between a bad and a good investment property. How to correctly compare traditional investments such as pensions, retirement annuities, unit trusts, share portfolios with any residential buy to let property. Shows you the equity, cash flow, and IRR( internal rate of return) for the next 30 years. 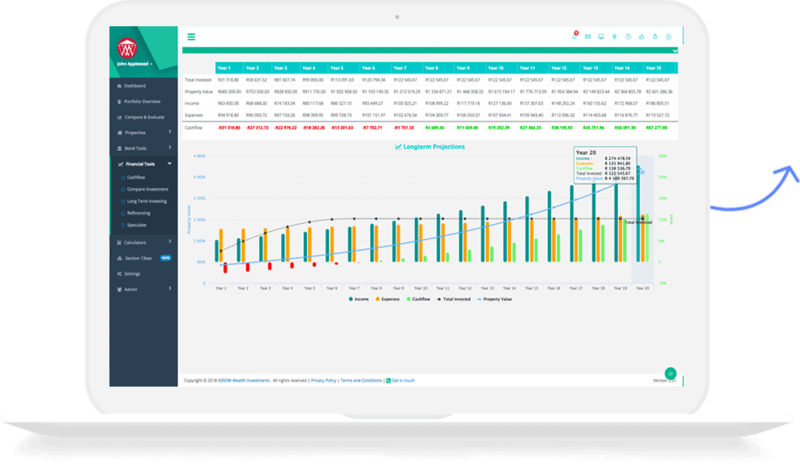 We set out to develop the world’s best online investors’ software program, that is user friendly with visually appealing graphs and report analysis. We knew that if we created an intelligent system, any ordinary investor would be able to achieve intelligent results in an instant by using our system. IGrow investors can now scale their property investment portfolios and run their portfolios as true business owners. It’s a proven fact that most property investors are never able to acquire enough high-income and capital-growth performing properties to become financially free. The two main reasons are that they don’t have a PLAN and a SYSTEM. Now investors can build a business based on mathematics and highly sophisticated analyses, leaving their emotion out of the deal. Accurate calculations and projections of future income, equity, and internal rate of return, up to 30 years in the future. No need to install the software on your laptop, and you can access your property analyses from anywhere in the world, from any device. Designed to be easy to use and visually appealing. Quickly and easily find exactly what you're looking for thanks to our navigation menu. 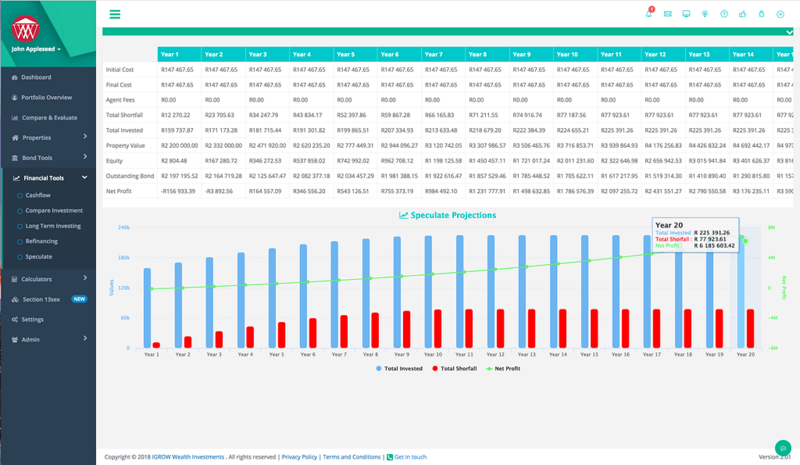 Use the software to make accurate predictions and calculations, such as future rental income and expenses. All calculations and property analyses can be presented in easy-to-read reports. 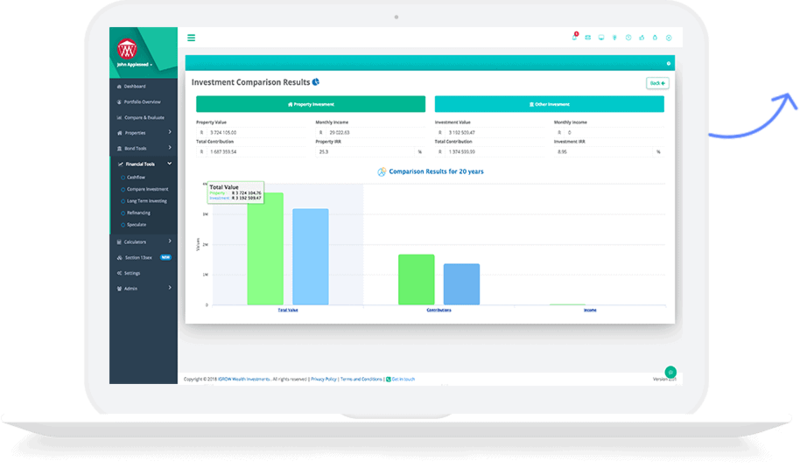 A whole new way to track and compare investment performance. Yes, I want the IGrow Property Software! Not sure if this Software is right for you? If you want to become an expert investor, understand underlying financial strategies and become a world-class decision maker on the highest growth investments, then IGrow’s Property Investor Software is for you. A fail-safe system to compare, identify and evaluate a great investment opportunity. 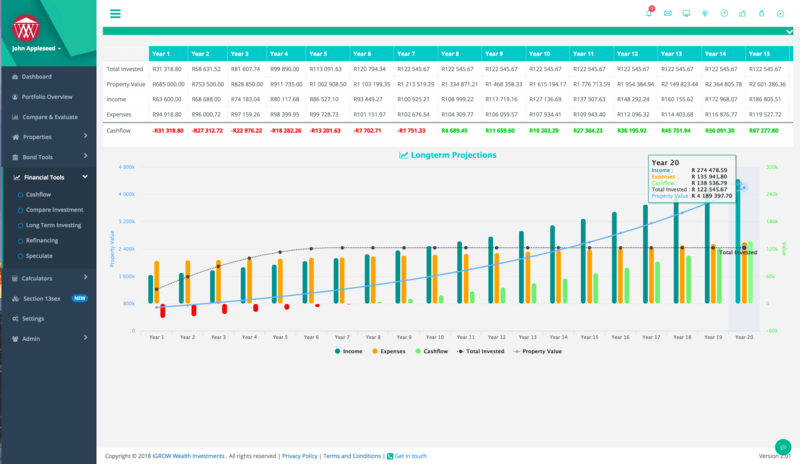 Short-, medium- and long-term projections to determine your cash flow, equity and future profits. You are able to easily calculate projections on a single property or a portfolio of multiple properties, to assess current and future performance. Compare different scenarios such as putting down a R100 000 deposit on a property vs investing R100 000 in a unit trust. Now you can compare apples with apples to see how powerful investing in property is vs other types of investments. Get a fair comparison even if investments are in different countries where the tax rates and management fees are different. 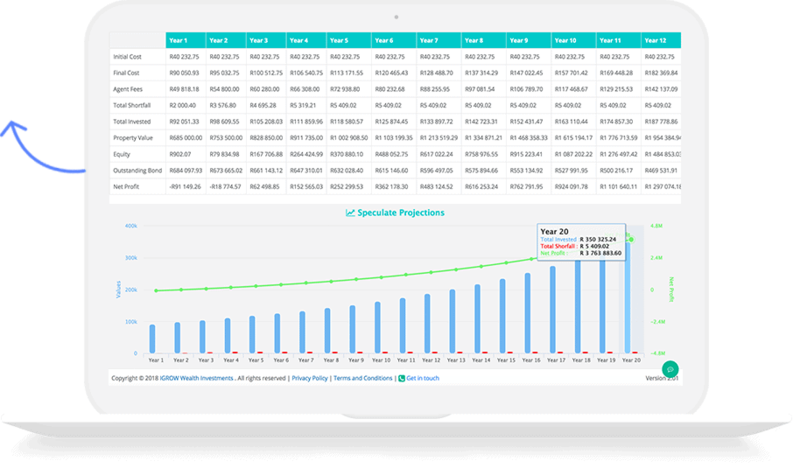 Do worst-case and best-case scenario planning, using different market assumptions and variables, all built into the software (with video help functionality). Section 13sex of the Income Tax Act. The IGrow Property Investor Software is the only program that has a special component dedicated Section13sex of the Income Tax Act. Compare 5 or more properties to see the benefits of Section 13sex and the varying returns in each comparison. The IGrow Property Investor Software allows you to see exactly what your property will do in the long term. It provides a detailed layout of all the figures over the entire bond period. 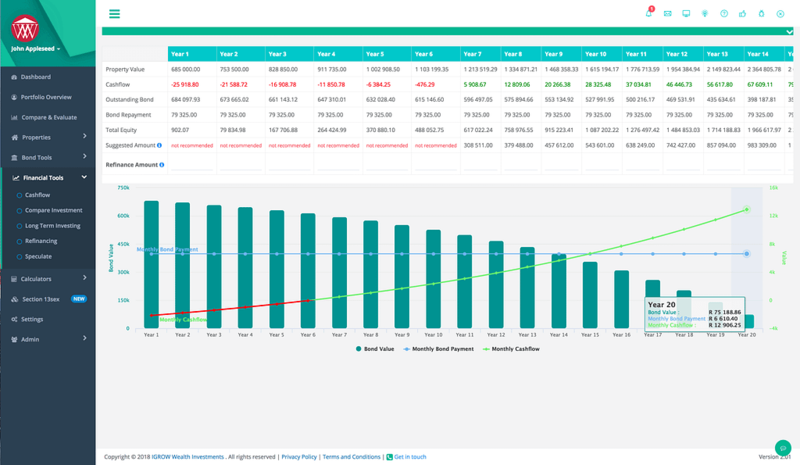 All this information is also plotted on our state-of-the-art interactive charting, so you can get a visual representation of the long-term performance of your property. Projections up to 30 years: an accurate overview of future income, equity, and internal rate of return. a variety of calculators allowing you to play around with the numbers. 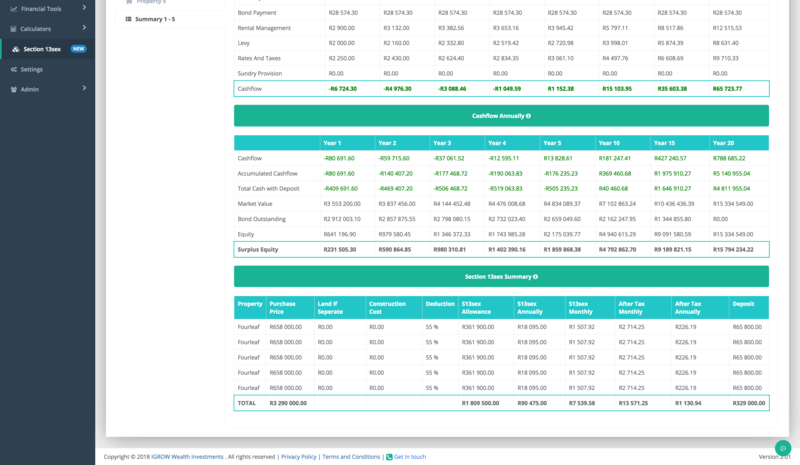 For example, the transfer cost calculator allows you to see what it would cost to you in transfer fees to buy a prospective property; the affordability calculator helps you work out a price range for the properties you can acquire, based on your current income. The creation of wealth doesn’t require genius, special talent, privilege or luck. But it does require an actionable system for investors to analyse their investment opportunities, from which to make informed decisions. What makes the IGrow Property Investor Software so unique? We designed the IGrow Property Investor Software to take into account the South African tax laws to show you how you can benefit from each of them. Unlike other, off-the-shelf software which simply tracks or projects your income and property growth, and is normally built around US or UK laws, the IGrow Property Investor Software has been developed to help you gear your portfolio for the best tax advantages according to the local regulations. Our cloud-based solution ensures you never lose your data, even if you lose the device from which you access the software online. All your IGrow Property Investor Software data remains intact and secure – all you need to do is log in with your email and password to access all your properties. The IGrow Property Investor Software will create a detailed timeline of every investment action taken on a property portfolio, from when a property has been added to when a deposit or withdrawal is made. Knowing when to refinance your property is key. With our effective IGrow 50/50 strategy, the IGrow Property Investor Software will help you determine not only the best time but also what amount you should refinance your property for. Get a visual indication of the impact that paying an additional amount each month will have on your bond, or the impact that storing your salary in your bond has on the interest each month. 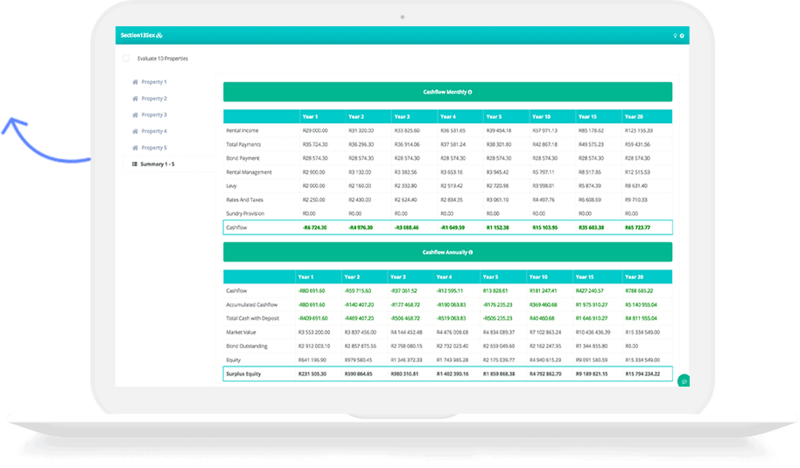 The IGrow Property Investor Software allows you to see exactly what your property cash flow will look like, up to 30 years in the future. 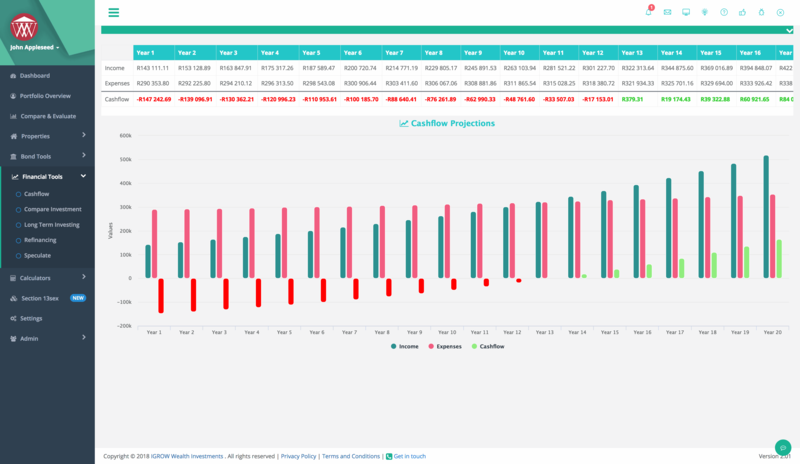 The entire cash flow movement will be represented on a chart, which will clearly indicate your cash flow. We are here to help. If you need assistance with any aspect of the software you can request a remote support session with a member of our team. 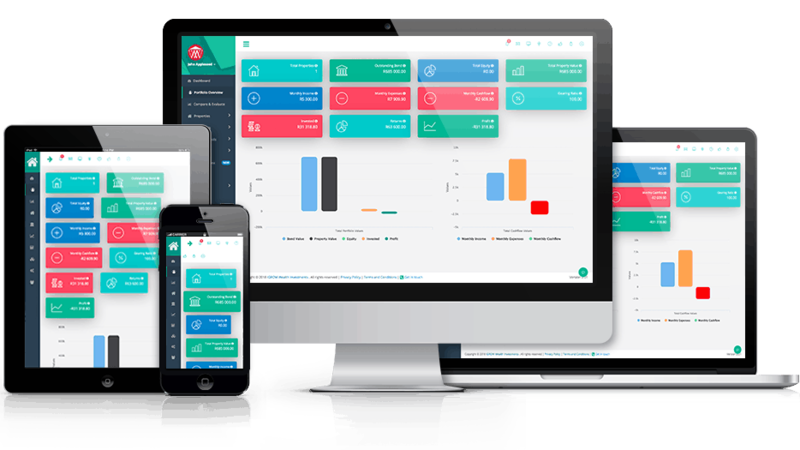 Looking for a specific feature or functionality to make your software experience even better? Let us know about this through the feature request function. The IGrow knowledge base contains a variety of informative articles. 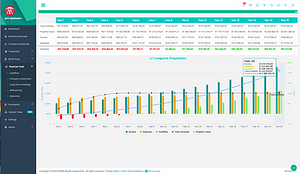 The IGrow Property Analysis Software will create a detailed timeline of every investment action taken on your property portfolio. Our new, state-of-the-art AI will answer any questions you might have. Alternatively, contact our tech support team. Book your seat to attend an IGrow seminar online, directly through the IGrow Property Analysis software. The IGrow Property Investor Software is an evolving educational and practical tool - the first of its kind - bringing cutting edge technology and property together. Now ask yourself how much is this worth to you. Put more simply, what would it be worth to you if you bought a R1 million property at 10% below its market value because you can quickly and efficiently crunch the numbers? What would it be worth to not make a financial mistake that could cost you hundreds of thousands of rands? Having a system to measure and manage the numbers will keep you from making costly mistakes. All you need to become an instant property investment expert is a laptop or smartphone. Check out our offer – for less than what you’d pay for 2 coffees per day you’re getting not just the most advanced property investment software tool on the planet, but also the most affordable. And for this ridiculously low price you are not only getting the world’s premium software system and tool but you are also going to get us…right beside you to ensuring you make the most out of the IGrow investor software tool. This is all thanks to our world-class customer support team. We have taken every step to ensure the IGrow Property Investor Software program is easy to use, with an intuitive user-friendly interface, Artificial Intelligence and a knowledge base center with step-by-step documentation. But sometimes you still want a helping hand. And we are here to make sure you get it. And if you want expert training and advice on how to build your multimillion-rand property portfolio from scratch, we have a top team of in-house chartered accounants, certified financial advisors, trust and tax attorneys, financing specialists (bond originators) rental management specialists and a maintenance team standing by to help you with the practical, street-smart implementation and execution of your property portfolio. You also get a dedicated property investment strategist for one full year, inclusive in our offer worth R5 000 for 12 months. Take action, leverage the planet’s top software and system for buy-to-let property investors and get in the game. If, after 7 days, you cannot see how this software is the answer to you building a multimillion-rand property portfolio, just reach out to our support center and we will issue you a full refund. So what are you waiting for? Just click on the link below to get started and we will see you on the other side. We do have other payment options available. Download our application form, complete it and send it back to us for approval and we will activate your software for you manually. Can I use the software to run a property portfolio? Yes, the software updates each month, updating, among other things which properties are tenanted or when a lease is nearing its renewal. If I would like a new feature to be added, can I request it? Yes, there is an option to request new features in the software. Will I be able to interact with other software users? Yes, there is a community section where questions can be asked and other users can respond and give their input. Your data is protected by the latest in encryption technology using a 256 bit encryption. The encryption standard used by IGrow is the same as that required of financial institutions to secure online transactions, so you can be sure that your connection and data is safe and secure. To further secure your account you can enable two-factor authentication. This will send you a login authentication code which you need to enter each time you log in. What does the IGrow software offer in addition to existing software on the market? The IGrow software is the first of its kind to provide an investor all the tools to track existing properties in their portfolio, in real time, as well as assess properties using the many tools at their disposal. The IGrow Software has been specifically designed to take into account the South African tax laws and shows you how you can benefit from each of these, such as Section 13sex. If I find a fault in the software, how can I inform IGrow? Like most software a bug may be identified. We would appreciate it if you reported this to help us improve the customer experience. Will there be updated versions of the software? 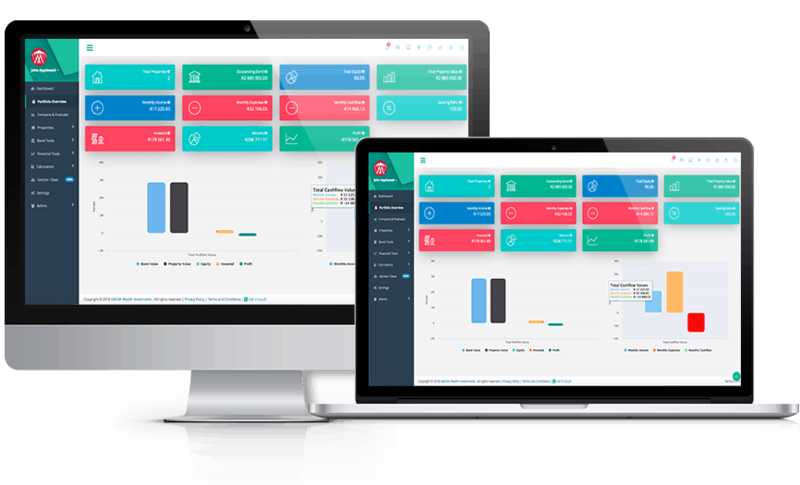 Yes, the software will be updated regularly with new tools or upgraded features to optimise your user experience. 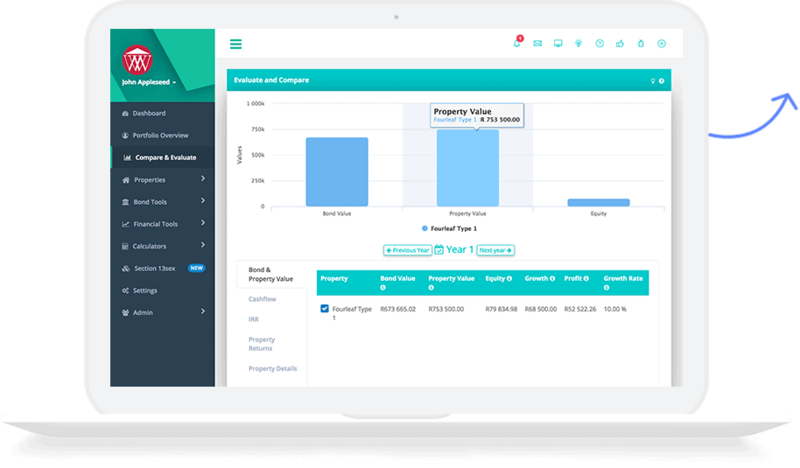 Yes, the software allows the user to track things like which properties are tenanted or when a lease is nearing is renewal, making it easy to manage a property portfolio in real time. Am I required to install the software? No installation is required: the software is entirely online and therefore can be accessed anywhere in the world from any device such as tablet or smartphone. Can I run a calendar of events through the software? Yes, you can add events – the functionality for which will be displayed on the dashboard. IGrow events, such as upcoming seminars and property launches, are also automatically added. Have Questions? Not sure if this Software is right for you? We will call you back to discuss your questions and showcase the benefits of the IGrow Property Investor Software – schedule a free, no-obligation consultation.